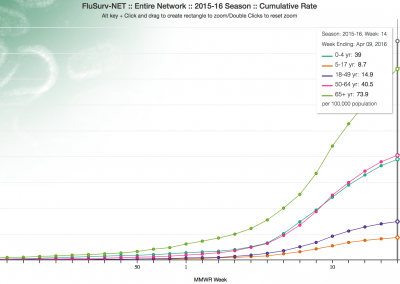 On paper, the flu season is a yearly nightmare. Every year, it comes at the exact same time, infecting and hospitalizing millions and inflicting casualties along the way. It is so serious the CDC defines it as a series of “epidemics”. But with vaccines and new treatments, the season has become less of a concern. Most individuals make sure to get a flu vaccine and usually rely on that to keep them safe. When people get sick, they make sure to slow down a little bit, eat healthily, and sleep just enough to quickly get better. Everyone gets sick once in a while, the important part is that life moves on. The flu season is just something that society moves past, like a harmless inconvenience. However, this flu season was more than just an inconvenience, and especially not harmless. As of right now, out of a population size of 100,000 people, around 105.3 people have been hospitalized for flu-related symptoms. 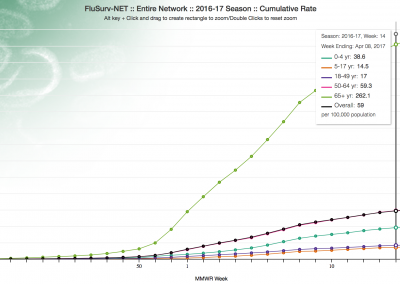 That is almost double last year’s estimate (61.4) and still significantly larger than the estimate for the last “severe” flu season of 2014-15 (63.9). In a country with a population over 300 million, that’s an increase of almost 100,000 people being admitted to the hospital, almost double the usual rate. There are other red flags, one is that the peak percentage of all mortalities due to pneumonia or influenza this year (10.7%) is above epidemic threshold levels (7%), almost matching the 2014-2015 flu season peak (10.8%). 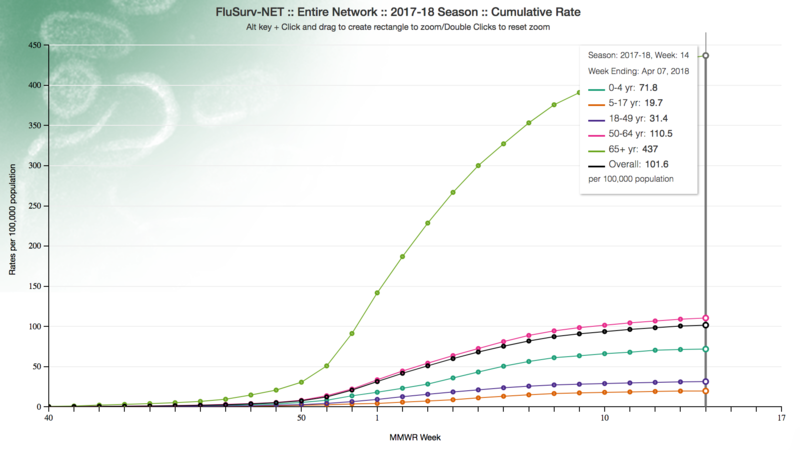 Another red flag is that the number of infant mortalities this season (160) has surpassed the last few flu seasons, including the mark set by the 2014-2015 season (148). 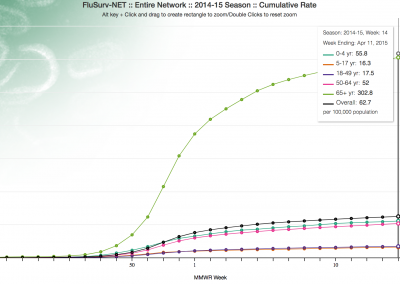 Simply put, this flu season has been one of the worst seen in decades. So what is happening? Was it just bad luck? It could have been colder this winter, maybe that is why the numbers were staggering this year. However, while one “bad year” isn’t indicative of any future trend, there are significant issues involving vaccines, how they deal with the current flu strain, and how public officials are managing the crisis that could lead to more devastating flu seasons. The situation is quietly spiralling out of control, and if these current problems are not addressed, everything could slip out of our hands at any moment. Influenza A and B are the main perpetrators of the flu season, with influenza A affecting the majority of all flu cases. Influenza A has had many infamous strains that have plagued populations, the major one being the H1N1 strain. The H1N1 strain was involved in the 1918 and 2009 flu pandemics. However, the clear major instigator in this year’s flu season was the H3N2 strain, a strain that is less famous but potentially more intimidating. H3N2, also known as the “Hong Kong” flu, was first introduced to the U.S. back in 1968. The virus was highly contagious, and spread to many other countries worldwide. Ever since then, it has been a regular in the flu season cycle, particularly due to its unpredictability. H3N2 has a high mutation rate, allowing it to make quick changes to its structure in a short amount of time. These quick changes make it very hard to anticipate and treat. 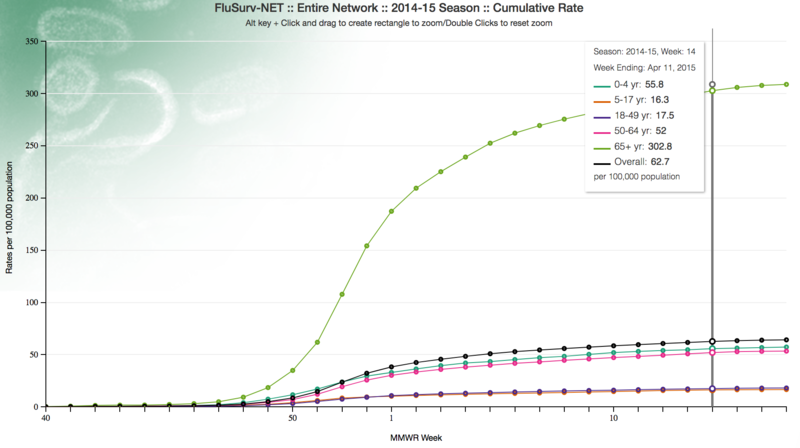 According to data from public health laboratories, around 60.57% of all specimens with the flu had H3N2. It is no surprise that H3N2 is more mutatable than H1N1 and all Influenza B viruses. The prevalence of H3N2 as compared to other viral strains is alarming, but the choices we have made in terms of flu prevention and management have done nothing to limit its reach. The three methods of vaccine creation. Click here to learn more about production methods. H3N2’s high mutability brings out a flaw in the current and cheapest method of making vaccines: eggs. In this process, viruses are injected into fertilized hen eggs. The eggs are incubated and the replicated, and the viruses within killed, purified, and collected. While this is a cost effective process that usually produces efficient results, the virus may sometimes mutate in order to adapt to the new environment of the hen egg. These mutations can occur at important sites in the “egg” virus, and cause it to differentiate from the circulating virus. Usually the mutations are not too excessive, which can be seen with the vaccine efficiencies with certain strains, such as H1N1 (67% vaccine efficiency). However, with a highly shifting virus like H3N2, the “egg” virus can differentiate substantially, rendering the vaccine useless. And it showed; the H3N2 vaccine had a 25% effectiveness in the United States, which was statistically significant enough to make an impact. However, in Canada and Australia the H3N2 vaccine had an effectiveness of 17% and 10% respectively, which were not high enough prevention rates to be deemed statistically significant. This raises a significant issue. If the vaccines that are relied on are only effective in 1 out of 4 people, we are setting ourselves up for failure. The Biomedical Advanced Research and Development Authority (BARDA) has anticipated this, and has helped fund development for two alternative ways to create vaccines: cell based and recombinant based. The first method, cell based flu vaccines, is recommended by the World Health Organization (WHO). In this method, the virus is raised in cells instead of eggs. The virus has to adapt less to survive in the cells as compared to the eggs, which increases the effectiveness of the vaccine. Additionally, the cells can be frozen and stored, which leads to a quicker vaccine production start-up in the case of an emergency as compared to other vaccine-creation methods. A company named Seqirus has already created a cell-based flu vaccine known as Flucevax which was approved by the FDA in August of 2016. The second method, recombinant flu vaccines, is currently the fastest method of producing vaccines. In this method, DNA of a specific part of the virus is mixed with the DNA of a virus that grows well in insects. This “recombinant” DNA is grown in insects. The FDA has already approved a flu vaccine created through this method, FluBlok Quadrivalent, for people 18 and older. These alternative vaccines are creating buzz, but it may be awhile before they begin to dominate vaccine circulation. Despite recommendations from various experts, there is scarce research to prove the benefit of these vaccines over traditional egg-based vaccines. Therefore, many companies chose to not partake or even abandon their cell-based vaccine research, as there was no reason to continue to pay for that research. Other scientists have chosen to abandon it, but because they think it doesn’t go far enough. These scientists are searching for something far beyond a vaccine that prevents one strain of flu, but rather a vaccine that prevents all strains of flu: a universal flu vaccine. Every year, experts vote on the specific flu strains to create vaccines for. The universal flu vaccine would solve that problem because it can prevent every strain. The logic behind the vaccine is simple: typical vaccines uses dead cells whereas the universal flu vaccine uses live cells. Essentially, by using dead cells, typical vaccines do not activate T-cells, a very important part of the immune response. T-cells . There are several types of T-cells, a couple of which are involved in destroying anything associated with a foreign invader. However, the crucial type of T-cells, memory T-cells, are focused on helping the immune system respond to repeat invaders. The universal flu vaccine uses a mutated form of the flu virus, one that increases its susceptibility to the immune system while not being as powerful as the original virus. By injecting weaker, live viruses, there will be both an antibody and T-cell response that will reduce the need for an annual flu shot. Convenience isn’t the only reason this is ideal, constant flu shots become counterproductive because less antibodies are produced with each subsequent flu shot. The universal flu vaccine is a fantastic concept; the issue is that it is still many years away. In fact, with strategies and funding just now being put into place, it may be a long while before anyone gets any looks at the universal flu vaccine. Until then, the only thing that can be relied on to have an impact are changes to current vaccines, changes that are unfortunately occurring too slowly. Something that needs to be understood is that vaccines have a real impact when it comes to flu protection, and the vast majority of people rely on them. In a few years, they might not have an effect at all. 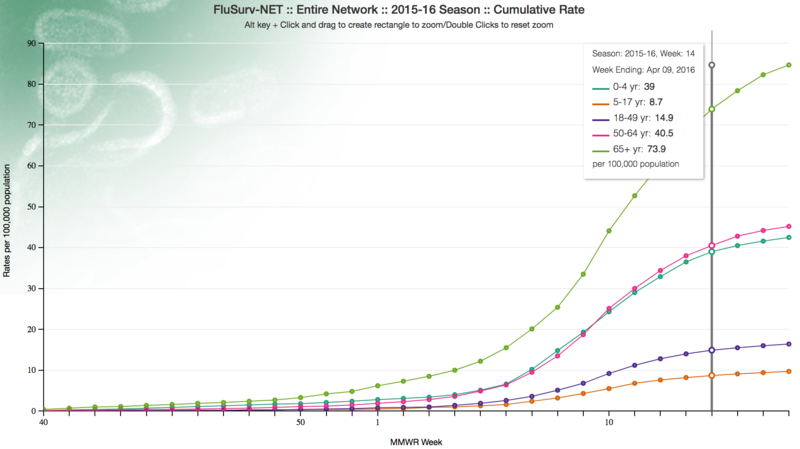 The past flu seasons have disproportionately affected older adults above the age of 65. This year, the amount of hospitalizations per 100,000 in the 65+ age range (454.3 people) are almost quadruple that of the next highest age range, 50-64 (114.4 people). This has been the case for the past three of the four years, starting with the 2014-2015 flu season when H3N2 began increasing its influence. Interestingly enough, the only year when the people over the age of 65 did not have a disproportionately high hospitalization rate was the one year when H1N1 dominated flu strains. Of course, the elderly have weaker immune systems that make them more susceptible to the flu. According to Dr. William Schaffner, a medical doctor and professor at Vanderbilt University, once a person over the age of 65 gets the flu and recovers from the flu, they might still be expected to face health-related difficulties that include an increased risk for heart attacks and strokes. Despite these facts, scientists are looking at a new reason for why the elderly are more at risk for being affected by the flu, a theory called “original antigenic sin”. The theory of original antigenic sin was created an early 1960s epidemiologist, Thomas Francis Jr. The idea of this theory is that the first flu strand someone is exposed to is the strand their immune system will memorize best, and therefore will be the strand their immune system will best be able to fight against. In addition, the family of the flu strand someone is first infected with will also be strands that your body will recognize and be able to ward off or quickly recover from. There are currently two flu family strands. The first is made up of H1, H2, and H5. The second is made up of H3 and H7. So if the very first flu someone’s body encounters in life begins with H2, then their body will better work against H1, H2, and H5 viruses and will have more trouble with fighting off H3 and H7 viruses. Based of this theory, everyone born after the aforementioned “Hong-Kong Flu” of 1968 (60 years ago) would have been first exposed to the H3N2 virus introduced. Everyone born before 1968 would have dealt with the H1N1 or similar flu strain that was more prevalent. Thus, adults in the first group will be more equipped to fight H3N2 than adults in the second group, which explains the significantly high number of hospitalizations in the 65+ age group. 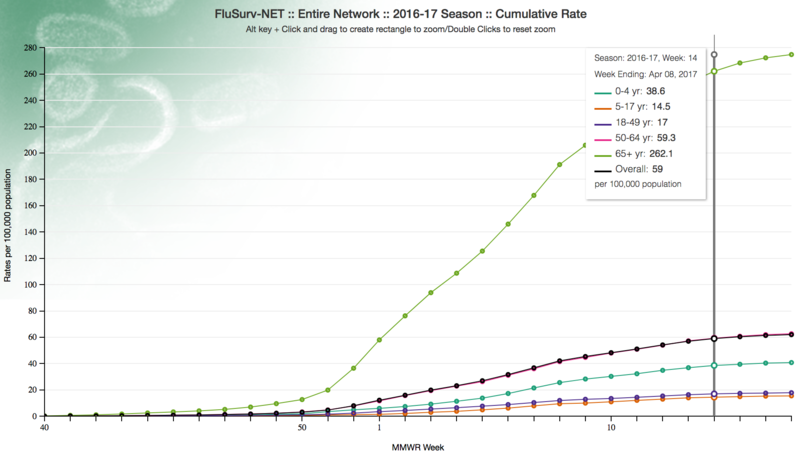 Again, this is simply a theory; however, we may see it grow more steam and support over the next flu seasons that H3N2 is sure to dominate. Generally, those in the 65+ age group require two flu shots per year: a regular shot and a higher dosage shot. It is a reasonable solution, but one that is not quite working for people aged 65 years and older as they continue to represent most of flu related hospitalizations and deaths. One solution to this problem is adjuvants. Adjuvants are a component of many vaccines that help increase immune response. They are not prevalent in flu vaccines; however, in 2016 the CDC approved of FLUAD, a flu vaccine with an adjuvant particularly targeted to those over the age of 65. There have been some preliminary research to suggest that FLUAD is more effective than regular vaccines, but nothing shows that FLUAD is more effective than the two shot treatment. 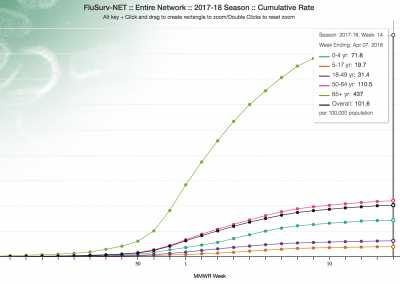 Regardless of the outcome of FLUAD and its effectiveness, the vulnerability of those aged 65 and up to the flu is very concerning, and hopefully the theory of original antigenic sin will supplement known facts to provide more insight into this problem. As said above, this year had a significantly large amount of hospitalization as compared to last year. With the large amounts of hospitalizations, especially compared to previous years, and the glaring red flags discussed above, it is imperative that hospitals are ready to catch the slack. Unfortunately, hospitals might be the most troubling red flag of all. As said before, the flu is not a large concern for the general population, and this ideology has cut the budget of hospital and public health preparedness by around 30%. With this, hospitals are running very close to the margins. Additionally, they already have their hands full outside the flu season. Therefore, during the short burst of hospitalizations during the flu season, hospitals would be reasonably distressed. The most concerning part about this situation is that it is already taking effect. There are reports of a nationwide shortage of saline IV bags due to the double hit of this severe flu season and Hurricane Maria, as it hit the large production plants in Mexico. These fluids are imperative to replenishing fluids and administering drugs to patients. Making matters worse, there are other reports of emergency rooms being swamped with sick patients[2,14]. These hospitals can’t direct the influx of patients to other locations because this has been a widespread flu season; every hospital in the United States is dealing with sick patients. Meanwhile, the governmental programs have its hands full when it comes to the public health scene in America. After dealing with a polarizing debate over health care plans, the United States is currently dealing with a horrendous opioid epidemic, which is shifting conversation away from the severe flu season we just had. It shows; the FDA received a budget increase specifically to help provide answers for the opioid crisis. Meanwhile, the CDC, which primarily deals with the flu, is facing a budget cut[9,17]. While it is important to elucidate that the CDC is said to lose money in areas specifically fighting global diseases rather than domestic diseases such as the flu, it is unclear what the complete consequences of the budget cut will be, especially with the shifts in budget and the constant debate over the health policy. This is not to say that it’s completely all downhill from here. The FDA Commissioner, Scott Gottlieb, promised changes in response to the shortages. First, they are making changes to solve the IV saline bag shortage exacerbated by Hurricane Maria. Second, while there were shortages of antivirals for flu treatment in some places, it was not widespread across the country, and they are making sure to monitor that situation closely. Third, the FDA made clear that they are working with providers, manufacturers, and dealers to catch supply gaps and make sure no shortages arise. Of course, this is just a statement, and time will tell if the FDA’s intentions were carried out. However, it is clear that the current issues did not go unnoticed, which is very reassuring. There is no other way to say it, the mistakes made this year led to one of the worst flu seasons in recent memory. The stubbornness involving egg-based vaccines has led to a near-useless treatment, leaving people unprotected. It doesn’t help that the flu strain it is supposed to protect against is one of the most highly mutable flu strain out there, one that senior citizens are more susceptible to than any other age group. On top of that, when people are in most need, hospitals are facing shortages in supplies, which is especially concerning because of the changes going on with the FDA and the CDC. There are a wide variety of red flags and there can’t be any definitive predictions of where the current situation will lead in the upcoming years. However, one thing is certain: this year was no anomaly. The H3N2 flu strain will continue to mutate and the US population will continue to increase, making management of hospitals and public health organizations all the more important. If we do not address these issues now, one flu season could spiral way out of control. Subscribe for updates on any new content! Francis, T, Jr. (1960, April 21). On the Doctrine of Original Antigenic Sin. American Philosophical Society, 104(6), 572-578.